Christmas trees are a staple of the season, and a great way to make your house feel festive. If this year you don’t fancy splashing out on a new one, sweeping up the pine cones and topping up the reservoir, why not be a little experimentative and try your hand at making one of these creative alternative Christmas trees instead! Attach your baubles at varying lengths to fisherman’s wire, then secure the other end to a lanyard ring. Glue your cardboard into a conical shape. You may have to trim the bottom so it sits flat on the surface. Cut out the centre of your coffee filters and bunch the outside to create ruffles. Slide the coffee filter onto your base and then glue into place. Continue this process up the tree. Once finished, you can customise the tree however you like. You could attach the glitter with glue, or spray paint the tree in its entirety. First, decide how you want your light tree to be on the wall. You can use blu tack to tack out and reposition where you want your points to be in order to get a clearer idea of how it will look. Start at a bottom corner and work your way up, crisscrossing the tree or simply creating a triangle outline if you prefer. Once finished, you can decorate your tree with baubles or stars attached to the wall, or alternatively leave it as just fairy lights. You could even do this in the corner of a house to create a 3D effect…. Turn your tomato cage upside down, and then pull the ends together to keep them in place. Wind your fairy lights around the structure of the tomato cage. Add decorations if you like, or leave as is. 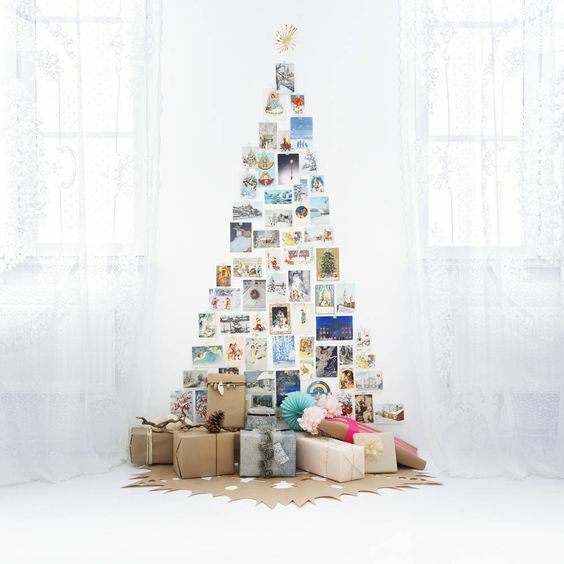 Decide where you want your string tree to go and use either a pencil or some blu tack to mark out the points. Hammer nails into the furthermost points of your tree, or, if you prefer not to make holes in your wall, use command hooks instead. Alternatively you could create this on a wooden board which you don’t mind hammering into. Wind your yarn around the outside points of the tree, and then work your way across, crisscrossing from point to point, until you’re happy with your design. If you want to decorate your twigs for this project, it’s easiest to do this first, before assembly. Break down your twigs so they vary in size from very small to around a meter long (depending on how large you want your tree). Lay your twigs out on the floor in the order and spacing that you want. Start from the top, leaving a few inches of string spare. Wrap your string around the centre of the smallest twig and then tie a knot in place. Tie a knot at the bottom, leave a space of one inch, and tie another knot. From where this knot starts, wrap the string around the next twig down. Repeat until you get to the bottom of the tree. Take your spare string at the top and tie this around a hook, so you can use this to attach the tree to your ceiling. Just attach them to the wall – this one’s that simple! You can use just about anything to create this, for example if want a more vintage look… Why not try using an (old and damaged!) book? Hopefully these photos have you feeling festive, and inspired to create your own Christmas tree, whether you have one already or not! If you do have your own tree and you want to know Christmas tree hacks for setting it up and making it last longer, find out how here. Feeling stressed about preparing for Christmas? We have these five top tips for the perfect Christmas at home.